Through last week, 80% of fast-growing technology companies who reported Q2 earnings had met or exceeded expectations, on average by 4%. As the earnings season has progressed, the tech sector is showing impressive signs of strength and predictability in the underlying companies’ business. Startups benefit from a booming public market for three reasons. 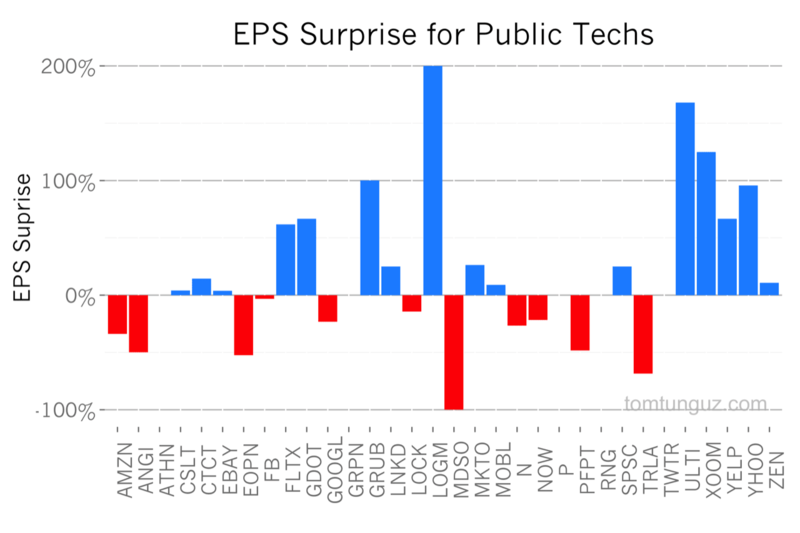 First, strong earnings buoy public technology share prices which drives M&A. The chart above shows the relationship between beating earnings and Enterprise Value to Trailing-Twelve Month Revenue Multiple (EV/TTM Rev). The correlation exceeds 0.53, indicating a moderately strong connection. As a consequence of higher stock prices, stock increases in value and cash becomes easier to raise and relatively less expensive, both of which entice tech publics to acquire startups, extending the current vibrant M&A market. Second, the valuation multiples commanded by public companies cascade to some extent to the private markets, first to the later stage businesses raising pre-IPO rounds, and eventually to the earlier stage markets. 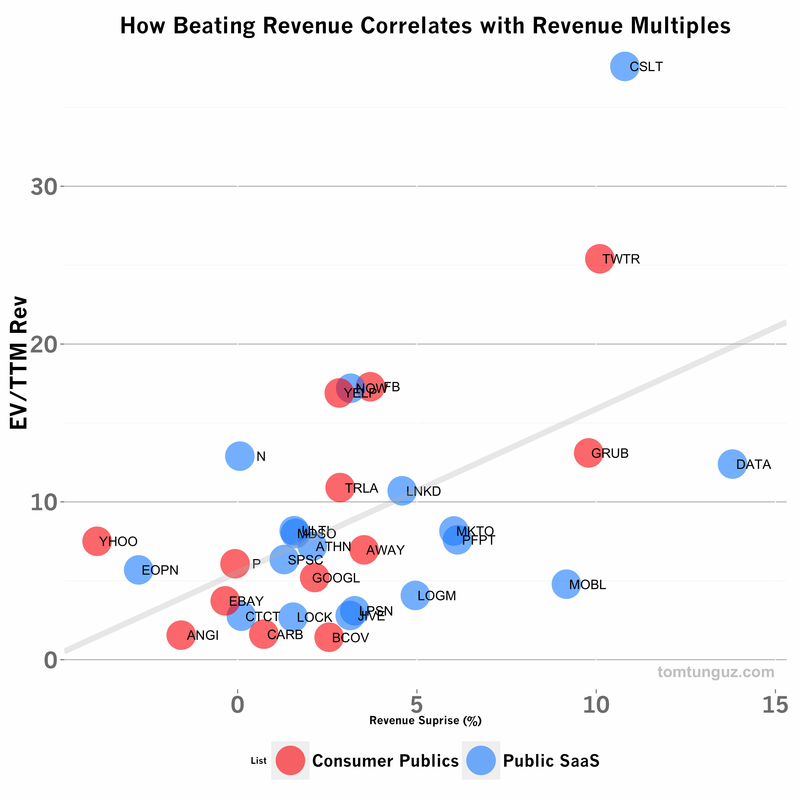 After the correction of about 40% enterprise companies and of 25% in consumer names, the median enterprise revenue multiple has popped back up 7.4x from 5.2x and consumer has increased similarly to 7.0x. Anecdotally, I haven’t seen much of a decline in early stage startup valuations after the February correction in the public markets. And the recent increase in multiples implies there is no deflationary pressure on startup valuations from the public markets. Third, the relative predictability consumer and enterprise publics indicates a relative fertile environment for startups to sell into. Advertising-driven models, SaaS business models, consumer hardware and marketplaces are all represented in the earnings figures so far. There are some EPS negative outliers, most notably Amazon. But Amazon’s massive EPS miss has more to do with large scale capital investment in AWS than a lack of a profitable business or customer base. 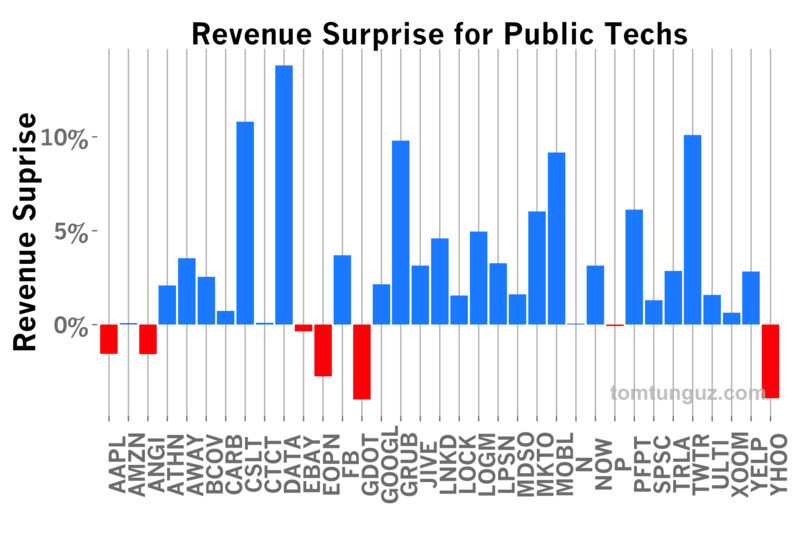 Below are the updated Revenue Surprise and Earnings per Share Surprise charts for the tech companies in the consumer and enterprise baskets I’ve been tracking. This represents about half of the companies in those baskets, but at this point, should provide a pretty representative view of the state of public technology companies. Overall, business is go, go go for technology companies despite the blip earlier this year in the stock market. And as the public companies exceed expectations, they will be pulling startups up with them.